Proprietary Name: Meijer Restore And Defend Sensitive What is the Proprietary Name? Meijer Restore And Defend Sensitive with NDC 41250-530 is a a human over the counter drug product labeled by Meijer Distribution Inc. 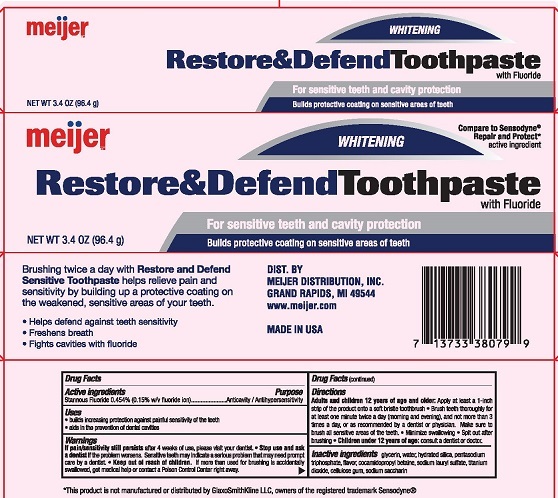 The generic name of Meijer Restore And Defend Sensitive is stannous fluoride. The product's dosage form is paste, dentifrice and is administered via dental form. WarningsIf pain/sensitivity still persists after 4 weeks of use, please visit your dentist. Keep out of reach of children. If more than used for brushing is accidentally swallowed get medical help or contact a Poison Control Center right away.